BD (Becton, Dickinson and Company) and Check-Points Health B.V., said today they have gained the CE Mark designation in Europe for a next-generation molecular screening test for antibiotic-resistant carbapenemase-producing organisms (CPOs) using the fully-automated BD MAX system. The BD MAX Check-Points CPO assay is designed to detect the five most common carbapenemase genes in less than 2.5 hours, compared with traditional methods that can take up to 24 hours. The companies reason that early detection of patients with CPOs can inform clinicians in sufficient time to carry out proper infection control measures. The assay is intended to offer an improved workflow and an additional target compared with an earlier version of the test developed by Check-Points, the company and BD said. 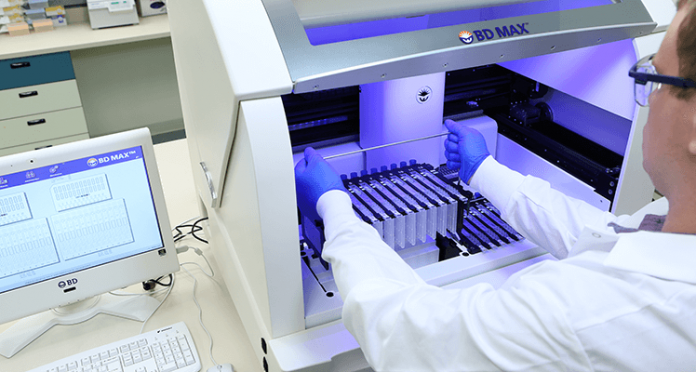 The BD MAX Check-Points CPO assay is one of three products offered by BD as part of a comprehensive screening and infection management solution designed to support clinical microbiology laboratories in their AMR programs, along with BD BBL CHROMagar CPE plated media* and BD Phoenix CPO detect panels. None of the three products is sold in the U.S. The BD MAX Check-Points CPO assay menu also includes syndromic panels for gastrointestinal infections, as well as reproductive and sexually transmitted infections, intended to aid laboratory professionals in their efforts to deliver diagnostic results that help enhance patient outcomes, while improving laboratory efficiency. The instrument also features an open system capability, allowing for streamlined workflow of laboratory developed tests and for additional assays via BD partner collaborations. The new assay is one in a family of BD MAX tests expanded with the launches of assays aimed at detecting vaginitis/vaginosis (which won FDA market authorization in October 2016) and extended enteric bacterial (FDA-authorized in May 2017). In a November 2, 2017, conference call with analysts following the release of fiscal Q4 2017 results, BD said it planned to launch additional BD MAX TB and enteric viral panel tests during its current fiscal year, which began October 1, 2017.